In May the box subscription service Loot Crate announced a new Limited Edition Crate. One that would celebrate the Ghostbusters film franchise for both the 20 and 21 centuries. With Ghostbusters (2016) on the horizon from Columbia Pictures, a Sony Pictures Entertainment company, new and “classic” merchandise could mean an all Ghostbusters crate was indeed possible. Last month around Ghostbusters 32 anniversary ghostheads were able to place their orders. Personally I don’t subscribe to any subscription box services. For a limited edition all Ghostbusters collectibles, I wouldn’t normally need to give buying a second thought. I did as with Ghostbusters (2016) being the shiny new Ghostbusters movie I knew their could be more Ghostbusters (2016) collectibles then GHOSTBUSTERS ones. I decided if their was one or more items I didn’t want I could sell hopefully for a small profit. I took a plunge into a river of Ghostbusters collectible. Which shipped in early July and arrived from California a little earlier this week. If you ordered this Limited Edition Loot Crate and either haven’t received your order yet and would like the element of surprise to have your own enjoyment, you may want to read my reviews of other Ghostbusters collectibles. They can be found under iRich. Anovos Productions LLC announced yesterday, although I wrote about it today (GBI Blog Post, April 30, 2016) they’ll be selling a licensed Proton Pack Kit. Proton Pack frame sold separately. Lights and sound kits to eventually come. Matty Collector also neither offered kits or a complete Proton Pack prop toy. I suppose we were fortunate enough to have a Neutrino Wand. It had me thinking of early ghostheads who built a Proton Pack as early as 1984. Something I had sorta forgot anyone (outside production on the films) had even attempted until I joined the Ghostbusters on-line community during the early years. This is a different type of Lego Ideas Ghostbusters project. A LEGO designer with the handle of MrLegoHouse has seemingly designed the first Lego Ghostbusters prop. I’m not sure if Lego’s license extends to prop toys. Upon first look this does somewhat resemble Matty Collector’s Neutrino Wand. If Lego could do it, it would be a different market and appeal to ghostheads. Like with what Matty Collector already produced, it would be incomplete without a lot of LEGO bricks to make a complete Lego Proton Pack. 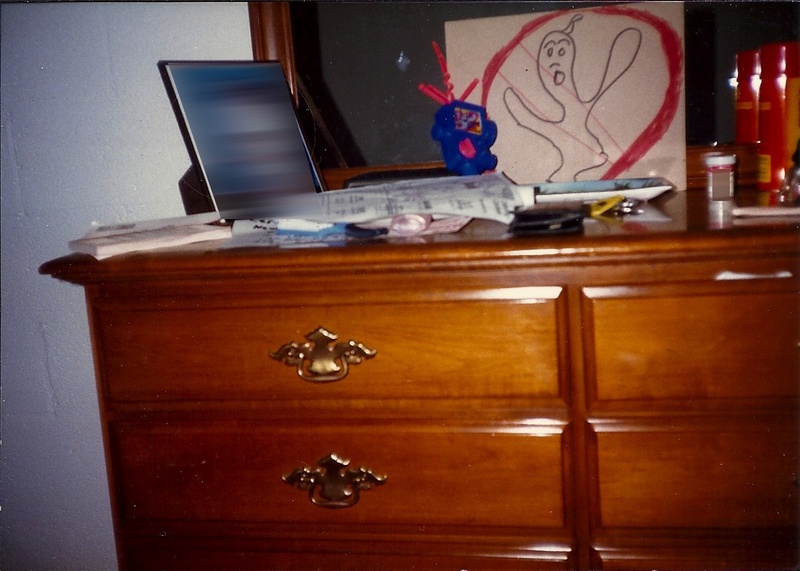 A long while back I was going through family photos and came across a few photos of 1980s Ghostbusters/The Real Ghostbusters memories. I was going to scan them to share when I had a chance. My “all in one” HP scanner wasn’t quite working with Apple‘s OS X, Version (10.9.3) aka Mavericks. This has been ongoing from HP and the solution for my model was a backwards workaround. I had been meaning to get back to scanning them with an easy solution, using my graphic software, Pixelmator. Which by the way if you have a Mac, unless you already use PhotoShop you owe it to yourself to spend $30 USD and buy Pixelmator from the App Store. 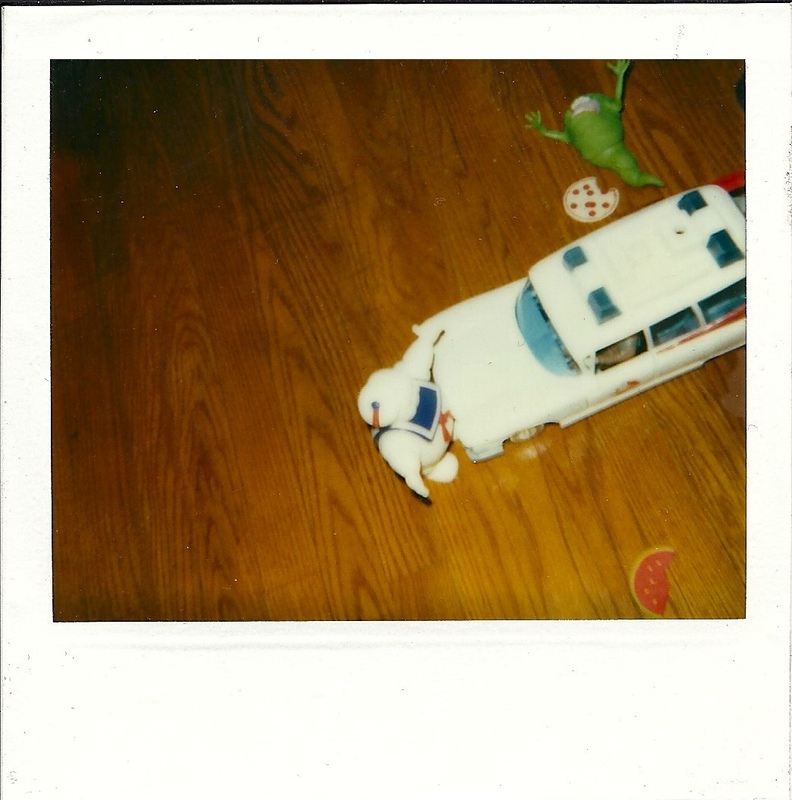 I scanned these three photos today for Ecto-Containment’s Photo(s) Of The Moment. I grew up in the same second floor apartment from about the age of 2 until we bought a house in my slightly younger thirties. This room use to be my bedroom and playroom until I was about 5 years old. As I was an only child and the second bigger bedroom was available, my parents gave me the room and that’s a room I’d grow up in, going through life’s various phases. When this picture was taken by I’m sure my oh so excellent photography skills my former room had become our living room. We use to have a bigger living room, it became our dining room for an overall bigger kitchen. I don’t know the exact year this slightly edited Polaroid was taken. I’m guessing sometime after April 1987, possibly before Kenner’s Fright Features line was released during 1988. I don’t remember if other The Real Ghostbusters toys were nearby, I seem to remember Ray was driving and was attacked by a not to scale Slimer and Mr. Stay-Puft who is right up on ECTO-1! Growing up my parents and I would fly from Newark, New Jersey to Charlotte, North Carolina. Then we’d fly to a smaller airport in the Tri-Cities area of Tennessee. We made this trip about every two years into my teens because my dad’s sister and our family live in the Volunteer State. I don’t remember bringing a Kenner The Real Ghostbusters P.K.E Meter, there it is. Perhaps like Egon, I had it with me, ya know just in case. When you’re in business, you need a logo. I drew my apparently “alternate” version of the Ghostbusters logo. I’m guessing the time of year was summer, long before we had an air conditioner. 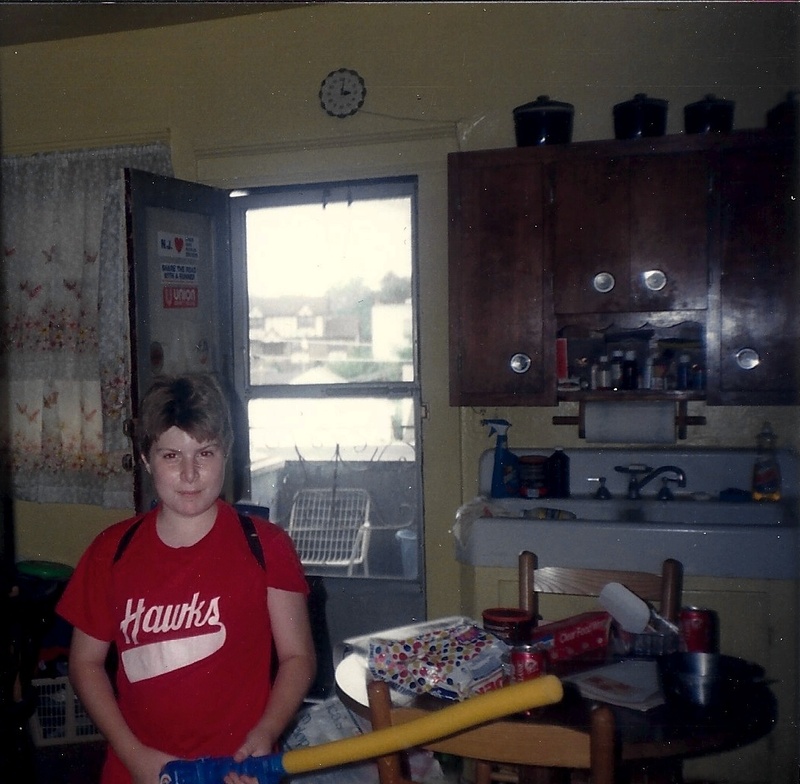 I’m wearing my town rec’s basketball team t-shirt, Hawks. I played a spirited game with the best of them at my old middle school. This picture is probably from 1988. Photo Credits: My parents and I.